Guiding Principles for Stabilization and Reconstruction presents the first-ever, comprehensive set of shared principles for building sustainable peace in societies emerging from violent conflict. 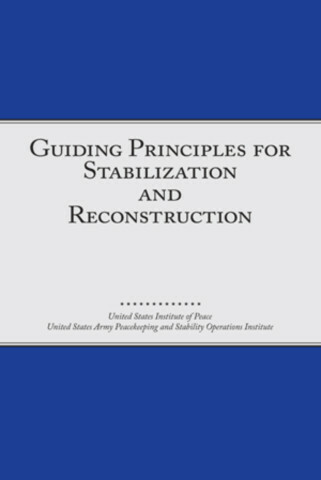 The manual serves as a tool for U.S. government civilian planners and practitioners engaged in stabilization and reconstruction (S&R) missions and is a valuable resource for international actors and nongovernmental organizations. • an overarching strategic framework for S&R missions based on a construct of End States, Conditions and Approaches. • a comprehensive set of shared principles and processes, distilled from the wealth of lessons that have emerged from past S&R missions. A product of the collaboration between the United States Institute of Peace and the Peacekeeping and Stability Operations Institute, this manual reflects the input of dozens of institutions across the peacebuilding community providing a comprehensive review of major strategic policy documents from state ministries of defense, foreign affairs and development, along with major intergovernmental and nongovernmental organizations that toil in war-shattered landscapes around the globe. "This book will have an incredible impact on the future of civil-military integration. Together with the Army's revolutionary Stability Operations doctrine, these complementary manuals will influence our national security for generations. No civilian should deploy without them."